Last weekend I finally made it to the top of Cave Mountain. 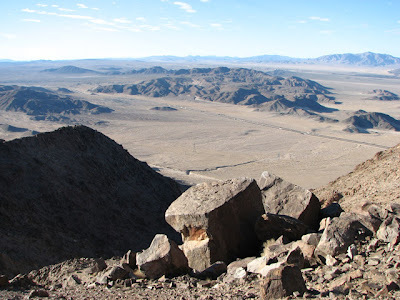 This short peak sits beside I-15 highway about 20 miles south of Baker, CA. It has a summit elevation of about 3600 feet. There are no trails to the summit, but it has been hiked by many people. 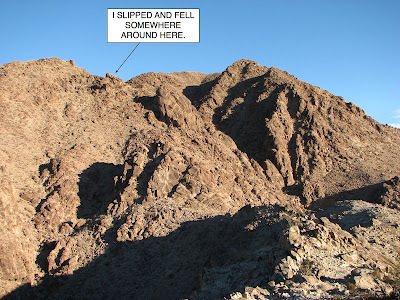 I found several web sites describing hikers' routes and it appears in Andy Zdon's book "Desert Summits." Here's a Google Map centered on the summit. 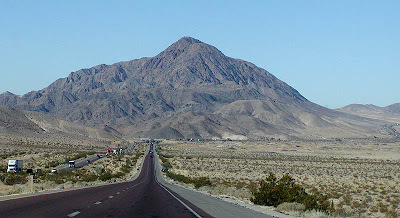 The Wikipedia page for I-15 shows the photo below of Cave Mountain as it appears to drivers headed south from Baker. I've hiked on the mountain many times, but have never before summited. This is mostly because I like hiking in the summer and the heat is terrifically draining. I've turned back several times because of muscle cramps, water consumption, and high winds. When hiking alone I stick to some strict safety rules and never "push on" because I'm "almost there", or other forms of summit fever. This hike was different for 2 reasons. First, the weather was good. The high temp was about 65F. There was almost no wind, with only a slight breeze. The weather was absolutely perfect for hiking. Second, Luke joined me on this hike. That would prevent me from wimping out for any totally lame reasons. He's used to hiking bigger hills, like Mt. Baldy, so this is probably no big deal for him. I parked on the powerline road below the northwest side of the hill. The route we hiked is the shortest and therefore the steepest. Our elevation gain was still only about 1820 feet over about 1.6 miles. Basically it's a steady climb up a ridge line of boulders. Here's a view up toward the top. Near the top, the boulders are huge. The cube-shaped one in this photo is about 10 feet (or more) on each side. As we got closer to the summit, we could see another hiker headed down. He appeared to be taking a route that I've taken before. In hindsight, that route is probably a much better one, since it's longer and much less steep. I looked down to where he'd have to start from (where I had started from when I took that route) and could see a car parked in the sandy wash. A few minutes later we saw 3 more hikers! Wow! During all my previous hikes, I've never seen any other hikers on that mountain. Here's a photo of the other hikers' cars. The sand in that wash gets too deep to drive any closer to the mountain from that direction. We made it to the summit. 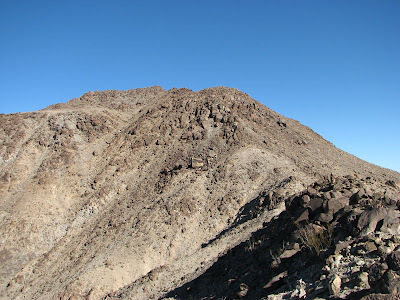 The post sticking out of a tall pile of rocks turns out to be a false summit and the real one is a little further along on the large and surprisingly flat summit area (considering the peak looks like a pyramid from the bottom). 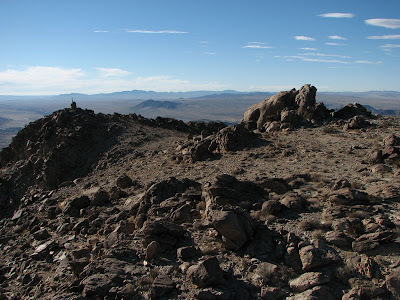 One large outcropping of granite seemed bigger than the others and it bore the USGS marker and summit log. 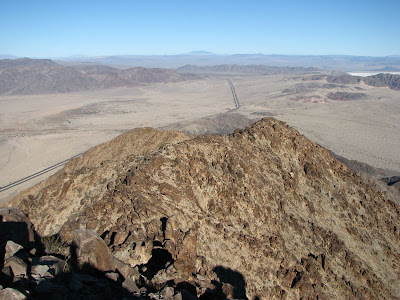 In the photo, you can see the post and rock pile on the left and the true summit boulders to the right. Here's a shot looking down toward Baker. This would be the reverse of the top photo. You can see Soda Dry Lake in the upper right. Baker isn't visible. It's to the left after that dog-leg in the highway. East Cronese Dry Lake is on the left of the image. The next shot is the view to the west. The I-15 highway is down below. 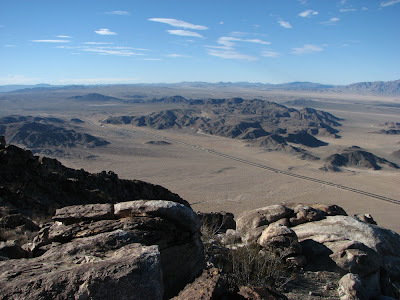 Barstow is about 40 miles to the left. The entire hike took 6 hours. The weather was perfect. It was a great way to spend a day in the desert. 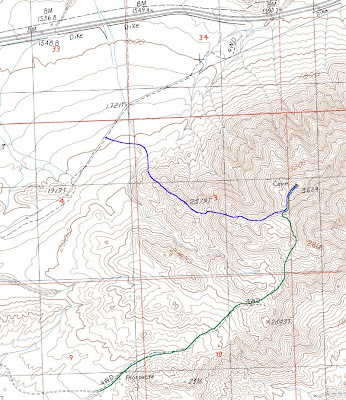 Here's a topo map showing our route in blue and the route taken by the 4 other hikers in green. Thanks for sharing the wonderful photos and commentary on Cave Mountain. I have seen and photographed it from I-15 many times, but was not aware that it could be climbed. The section on Hands station was likewise appreciated. Keep up the good work! Well thanks for the nice comment! Positive feedback is always welcome.